My mother will be 95 years young tomorrow. Physically she’s not as mobile as she once was. She still has her mental faculties, although by her own admission she does have “intellectual interludes”. Don’t scoff, I’m twenty-nine years her junior, and I have them as well. Today one of my brothers and I travelled to Whanganui and took Mum and my sister out to lunch at their favourite café, where we chatted about everything from last week’s disastrous floods – the worst in in recorded history in the Whanganui region, to a recent case where the courts declined to give a cancer sufferer the right to seek assisted suicide, to the influence American churches have on US politics, to the anniversary of the Rainbow Warrior affair, to catching up on the affairs of our whānau (extended family). Afterwards we returned to the home shared by my mother and sister, where we continued with our conversations while preparing for afternoon tea when a horde of grand children, great grand children, and friends and well wishers arrived. 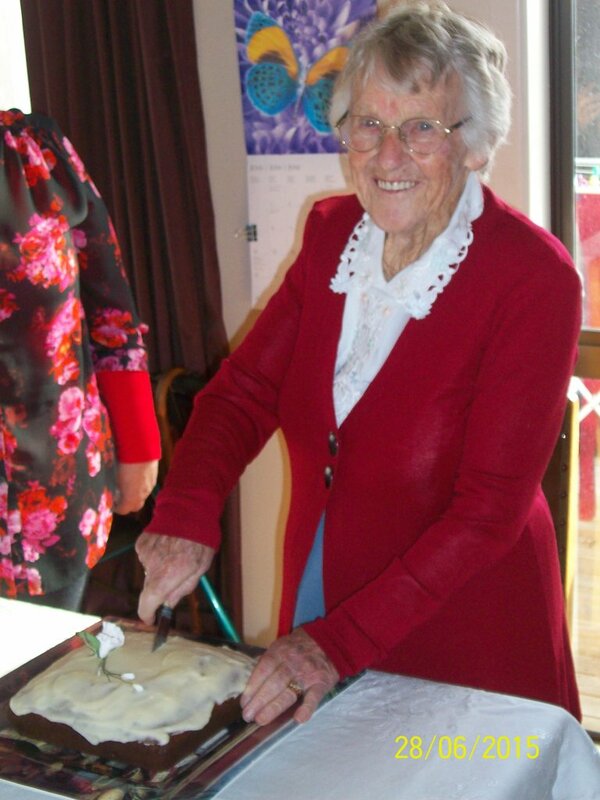 As can be seen in the photo of Mum cutting the cake, she is still in good health, and thoroughly enjoyed the day. At the rate she’s going I won’t be surprised if we celebrate her 100th birthday in five years time. Categories: familly | Tags: 95th birthday, family, Life, Mum, whānau | Permalink.